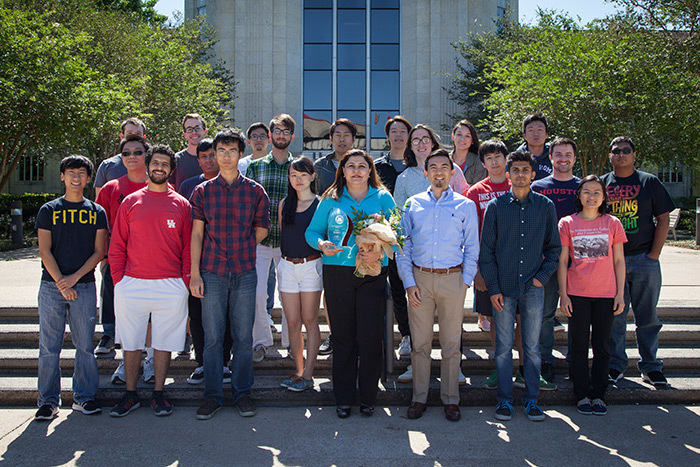 Dr. Nouhad Rizk, instructional associate professor in the Department of Computer Science, was awarded with a 2017 University of Houston Teaching Excellence Award for Instructional Faculty, one of the university’s highest honors. 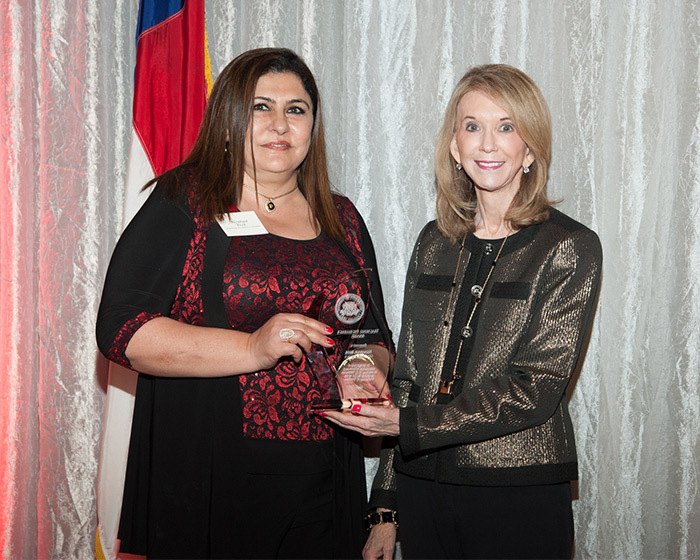 Nouhad Rizk (left) with Provost Paula Short (Photo Credit: Gary Maltz at Alexander’s Fine Portrait Design)The Teaching Excellence Award recognizes excellence in the classroom and is awarded annually in the spring at the UH Faculty Excellence Awards Dinner. Rizk goes beyond the traditional classroom teaching model by incorporating peer learning and gamification to help students learn more effectively. She has found that peer learning projects help students develop their communication, problem-solving and conflict management skills. “These skills are relevant not only in the classroom but are also crucial in the workforce,” noted Rizk. She also likes to have fun. “[Rizk] had a unique way of conducting her classrooms that kept the whole class involved and energized,” wrote a student nominator. “She uses games to engage students in ways that help the most reluctant learners become focused and involved in their own education,” wrote a former student. In a nomination letter, a former student, now UH alumnus, wrote about how Rizk helped turn his life around. “...I had just come back from academic suspension, and by all accounts it looked like I was continuing the same path. A week or so after the first midterm…[she] stopped me on the way out. Rather than criticizing my dismal performance on her exam and point out the correlation to my lack of attendance and laziness, she asked me, ‘...how can I help you succeed?’ Through her genuine care, and the level of confidence in me I was able to turn a corner in my life.” This student went on to become an undergraduate teaching assistant for the course, graduated and now works for a well-known oil and gas company. “She genuinely cares about us as individuals and serves as a life mentor as well as an academic mentor,” wrote another former student, now UH alumnus. Rizk joined department in 2007 as an instructional assistant professor after earning her Ed.D. from Leicester University in the United Kingdom. In addition to teaching, she currently serves as Director of Undergraduate Studies, an administrative position responsible for ensuring the success of all undergraduate computer science majors. In 2012, she was awarded with the Computer Science Teaching Excellence Award. A full list of current and previous awardees is available online.